Staying relevant in the fashion industry, while maintaining my ethics, was something that I grappled with a lot. As issues of sustainability and ethics became more important in my life, I began to question if “staying relevant” was really an issue at all. Was this just an insecurity that I developed after 15 years of advertising telling me I wasn’t good enough if I didn’t have the latest trend? I realized the questions I was having were actually masking an even deeper truth. I was unsure about who I was, and fast fashion only perpetuated that confusion. "I was unsure about who I was, and fast fashion only perpetuated that confusion." Beginning as a teenager, as most of us deal with issues of identity, I questioned who I was and how I wanted to present that person to the world. One year I felt goth and the next year hippie. As fast as I could throw out one identity (and the clothes that went along with it), I was replacing it with a new one. Stores like Hot Topic, Wet Seal, and Forever 21 provided trendy clothes at dirt cheap prices, and fueled my search with lots of wear and waste. Although I am thankful for these years of exploration, they lasted way too long, and far beyond my years of teenage angst. Throughout college, and into my career as a model, this confusion didn’t go away. With newer, more trendy stores like H&M and Zara, I never wanted to stop and think about my own personal style… the one that reflected who I am deep inside. I wanted to keep up with the trends and remained prey to the constant “Hot and Not” lists that advertisers and fast fashion CEOs count on. It wasn’t until graduating college, going vegan, and investigating the vast environmental issues facing us, that I started to even question who made my clothes. A film premiere in New York of the documentary called True Cost was the catalyst for my journey. Released after the Rana Plaza disaster on April 24, 2013, it highlights the astonishing inequality that garment workers are subjected to across the globe. It shows the horror of the 1,134 people who were killed and the over 2,500 that were injured in Dhaka, Bangladesh when the complex collapsed. Despite earning my degree in Biology, the massive affect of the clothing we wear on the environment hadn't occurred to me. True Cost demonstrates how and why the fashion industry is one of the largest polluter on Earth, perhaps less damaging than the oil industry alone. ** Fast fashion being the main culprit. This film was not only an eye-opener but it also marked a huge turning point in my life. I knew something had to change and that my mindless consumption of fast fashion had to stop. My true identity, no longer a question of outward appearance but something deep within, was finally able to take shape. Limiting my purchases to consciously manufactured pieces and consuming only that which I truly need, each item of clothing that I would own from that day forward needed to truly reflect the person that I am. My clothing also needed to last, which meant I had to be comfortable with that identity for a long period of time. For the first time I was forced to really ask myself, "Who am I?" and "How will I present this person to the World?". Although it was difficult at first, with practice and time I have been able to curate a wardrobe I feel confident in wearing over and over again. I have pieces that are sustainable and ethically made that all fit together. I have formed a unique capsule collection of clothing that confidently reflects my true self. "Limiting my purchases to consciously manufactured pieces and consuming only that which I truly need, each item of clothing that I would own from that day forward needed to truly reflect the person that I am." I now know that the clothing choices I make have a huge impact. “80 billion pieces of clothing are bought each year, and on average we only wear 20% of the clothes in our closet. The average American also throws away 82 pounds of textiles each year, adding to 11 million tons of textile waste in the U.S. alone." Giving up fast fashion therefore reduces huge amounts of toxic waste in landfills. Without much effort on the part of consumers, buying less and choosing well, also reduces the degradation of Earth’s waterways and ecosystems. Climate change is real. We are using up the Earth’s resources at a rate that compares to no other time in history. In order to sustain life in the way that humans are living now, we would need SEVEN planet Earths. The little things that we, as individuals, do everyday all add up to combat climate change. Ask the question, “Who made my Clothes?”, and stop supporting brands that exploit their labor. Investigate the environmental affects that our clothing has. Fashion Revolution and one of my favorite brands, Zady, both have vast amounts of information on their websites available for free. If you haven't seen the movie, True Cost is available for viewing via their website, Netflix, Amazon and iTunes. I cannot recommend it enough. Giving up fast fashion has not only been an inspiring and fun journey for me with my clothes, but also helped me find confidence in how I present myself to the world. Never underestimate the power of small, daily actions that all add up to be a huge reduction in our carbon footprint. Not only will you be supporting our fellow humans and the planet, but you may even find out more about yourself. I became vegan 3 years ago, after 4 years as a vegetarian, because I care deeply for the environment and wildlife. The decision arose from a startling awareness of the need for a drastic change in my consumption habits and society’s as a whole. I realized, in the beginning, that I could make a positive impact by changing the way I consumed each day. I no longer use plastic bags, stopped purchasing products with biologically harmful chemicals, boycott products with palm oil, and gave up fast, unethical fashion. The most important change I made, however, was with food. I realized that, by giving up animal products for good, I could make a positive change, 3 times a day, 365 days a year. Carbon dioxide, the greenhouse gas that usually comes to mind with regard to climate change, is not the greatest gaseous emission causing rising temperatures. According to the Intergovernmental Panel on Climate Change, “Methane is even worse for global warming than carbon dioxide is. “For example, over a 100-year time horizon, one metric ton of methane and 21 metric tons of carbon dioxide trap an equal amount of heat in the atmosphere (3).” If methane has 21 times more global warming potential (GWP) than carbon dioxide, we need much stricter regulations on animal agricultural industries and innovative approaches, such as permaculture, to make the industry cleaner (4). Industry responds to the demands of the people, therefore, society as a whole must insist on greater change. Giving up meat once a week is not enough. To safely limit the increase in global mean temperature to 2°C above pre-industrial levels, we must commit to eating less meat every day. "According to the IPCC, “Methane is even worse for global warming than carbon dioxide is." 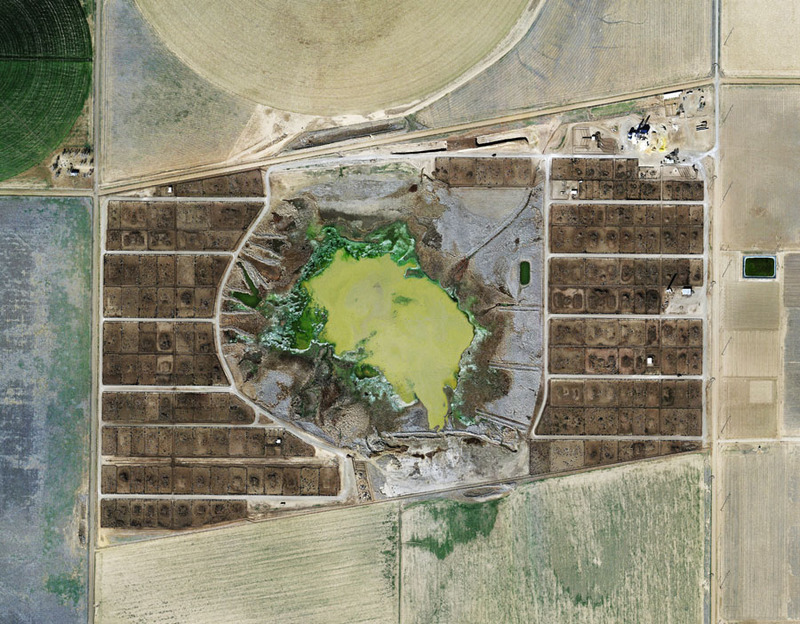 / Photo of a cattle farm and its waste lagoon in Dalhart- Texas 2013 by Mishka Henner titled "feeder"
Methane output, however, is not the only contributor of animal agriculture to climate change. The practice has negative impacts on our planet in many ways. Producing animal products for human consumption provides fewer calories than if we ate the feed crops ourselves [see table (7)]. Corn and soy production necessary to feed cattle, chicken, and pigs require tremendous input from fossil fuels, as well as substantial quantities of fresh water – itself a scarce commodity in drought stricken areas. “In 2011, 41 countries experienced water stress – 10 of which are close to depleting their supply of renewable freshwater and must now rely on alternative sources. By 2050, it is projected that at least one in four people will be affected by recurring water shortages (2).” Deforestation is happening on a global scale as oxygen producing, CO2 scouring trees are eradicated from the landscape to make room for crops and pasture land (8). Sewage runoff from industrialized animal agriculture is another problem for our environment and global temperature. Leakage from Manure lagoons and holding tanks can enter fresh water systems, creating dead zones around the world, and increase acidification of our oceans. Despite being landlocked they indirectly contribute to the bleaching of our coral reefs and are making our oceans uninhabitable for marine life (9). Oceans are already over-fished. According to the WWF Living Planet Report, “Factory fishing has emptied the seas of 40 percent of sea life, and nine out of 10 fisheries in the world are either overfished or full-fished today (10). The last thing we need to is eat more fish in place of pork or beef. 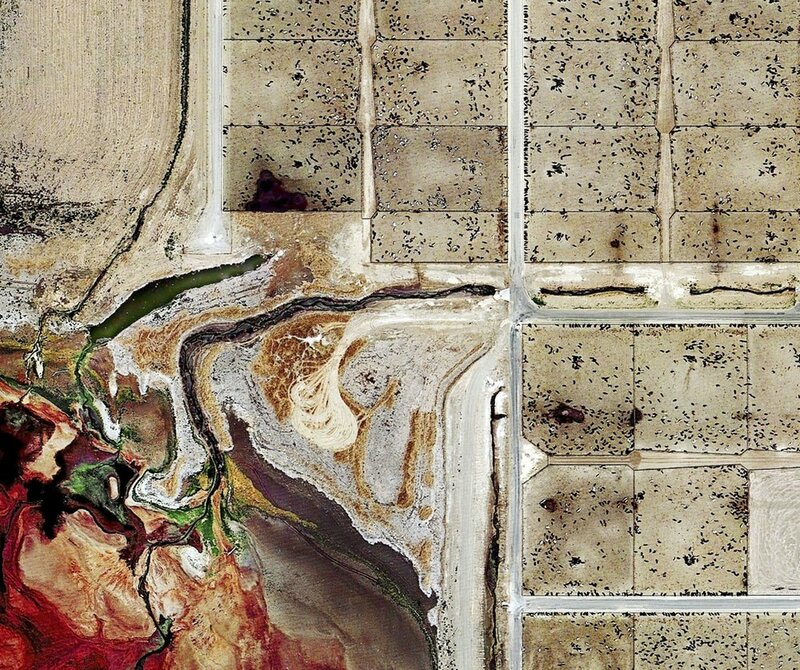 pHOTO detail OF A CATTLE FARM and ITS WASTE runoff into a manure AGOON -DALHART, TEXAS 2013 / BY MISHKA HENNER TITLED "FEEDER"
The underlying cause of global warming is complex to say the least. The way our consumption choices affect the ecological balance in one part of the world, they can also affect natural systems across the globe [e.g. Greenland’s Ice Sheets (11)]. Global Warming is the largest threat to humanity and our entire planet, and we created it ourselves by doing too little or nothing at all. Of course, we were not alone. The opportunistic enthusiasm and financial backing of giant corporations operating worldwide are leading us to a future Earth that is uninhabitable for wildlife and humans alike. Our individual decisions do make a difference, and every effort to affect change counts, but we cannot tackle this battle without more far-reaching changes in our daily lives. Meatless Monday, albeit a step in the right direction, is no longer enough. We can move beyond excessive animal product consumption with balanced diets that do not include meat at all. But we also need fast, global action from those in power to support these changes. Global Industry and agriculture must move beyond meat as the source of their profits. Individuals, once educated and driven to demand change, can only do that: demand change. Governments, united to save life as we know it, are the crucial force behind meaningful progress. Together with action from those in power we can stop this planetary disaster. 3. IPCC/WMO/UNEP. "Climate Change 1995: Impacts, Adaptation, and Mitigation of Climate Change: Scientific-Technical Analyses." Prepared by IPCC Working Group II. Cambridge, UK: Cambridge University Press, 1996. 4. Holmgren, David (1997). "Weeds or Wild Nature" (PDF). Permaculture International Journal. Retrieved 10 September 2011. 6. EPA (2010). Methane and Nitrous Oxide Emissions from Natural Sources. U.S. Environmental Protection Agency, Washington, DC, USA. ***This article is part of a collaboration between the United Nations Development Programme (UNDP) and the Ethical Writers Coalition.